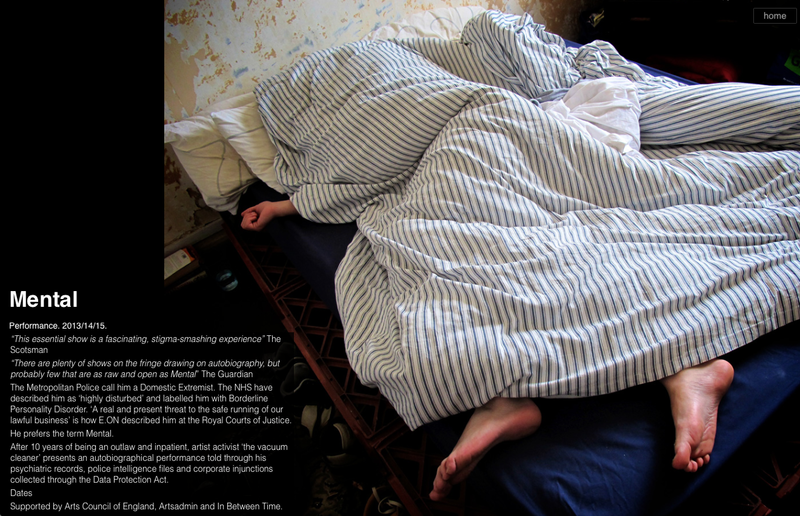 Dr Victoria Tischler reviews 'Mental - the vacuum cleaner' at the Freud Museum, 29 September 2015. "The Metropolitan Police call him a Domestic Extremist. The NHS have described him as ‘highly disturbed’ and labelled him with Borderline Personality Disorder. ‘A real and present threat to the safe running of our lawful business’ is how E.ON described him at the Royal Courts of Justice. After 10 years of being an outlaw and inpatient, artist activist ‘the vacuum cleaner’ presents an autobiographical performance told through his psychiatric records, police intelligence files and corporate injunctions collected through the Data Protection Act." There we sat, around 25 of us on Sigmund Freud's bedroom floor with the vacuum cleaner – aka James Leadbitter – who lay deep under his duvet in our midst. Surrounded by piles of case notes, his medical records, so many they seemed to swallow him as much as the duvet did. Freud, in shadow across the screen, cast across the bedroom walls, observing from a distance. On the occasion of the Philadelphia Association’s 50th anniversary we revisited the radical ideas of Ronnie D. Laing and colleagues: in short to listen to and talk to people in distress. Hardly radical and yet in our time-poor, CBT yourself back to work in just 6 sessions, slap on a label and medicate it, production-line era, this message was an ironic reminder of the fundamental importance of person-centred care and how it seems to have been forgotten in the mental health system being cut in the name of efficiencies. I, a former mental health professional, experienced toe-curling culpability as I witnessed the vacuum cleaner’s patient and personal testimony. He rose up from under the duvet and illustrated using his case notes on OHP, the (important) points highlighted – many sweeping and generalised attempts at diagnosis, and often contradictory reports. Such is the difficulty with prescriptive accounts of mental distress. Yet all the agents involved – police, doctors, nurses, security services and therapists, conspired to monitor, contain and categorise the man lying before us on the bed. He was a person to us, but a domestic terrorist to the authorities. He was variously described as: a diagnosis unstable PD, schizophrenic, high scorer on the GHQ, anxious, suicidal, self-harming, manipulative and dangerous. On and on it went. Personal trauma, absurdity and cruelty enacted. The performance evoked powerful bodily surges of empathy. His pain that words can’t describe hung heavy in the intimate space as the audience sat in stillness and silence. I winced as the vacuum cleaner described various failed suicide attempts. When it began to feel unbearable, and visitors were advised at the outset that it was ok to walk out, the vacuum cleaner played his favourite tunes on vinyl and introduced the purest black humour. On his attempt to hang himself the flex broke, ahhh, this is not my method he wryly concluded. The stocky ICD 1 male referred to in a police report: I call him Gavin. Towards the end he emptied a large cardboard box onto his bed. Out came hundreds of boxes of psychotropic and other mood stabilising drugs, plus drugs to counteract the drugs etc etc. The weight of the treatment regime left physical and metaphorical scars. On his back, scratched deep into his skin, a message to his tormentors. This was an important albeit hard to swallow performance. The simple truths of Maslow’s hierarchy shone through. We all require our basic needs to be met in order to grow. We need shelter, safety, food and relationships to sustain us. Only then we can heal and recover. All those concerned about the care of those who experience mental distress should heed the words of the vaccum cleaner and the Philadelphia Association: especially those responsible for cutting mental health services.